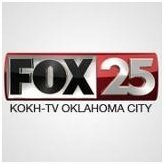 News TV Channel / KOKH-TV, virtual channel 25 (UHF digital channel 24), is a Fox-affiliated television station licensed to Oklahoma City, Oklahoma, United States. The station is owned by the Sinclair Broadcast Group, as part of a duopoly with CW affiliate KOCB (channel 34). The two stations share studio and transmitter facilities located on East Wilshire Boulevard on the city's northeast side (situated to the adjacent east of the respective studio facilities of the duopoly of CBS affiliate KWTV-DT [channel 9] and MyNetworkTV affiliate KSBI [channel 52], and the Oklahoma Educational Television Authority [OETA] PBS member network).